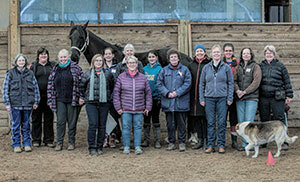 This year I was fortunate enough to be invited to teach at Heroncrest Stables, near Ottawa Ontario. I was there in the spring and had a great group turn out for it. I got to go back in October and thought I’d share some of the pictures and stories with you now. In the first clinic I introduced the foundation lessons and we did a lot of human with human learning. I always start this way and often revisit it. 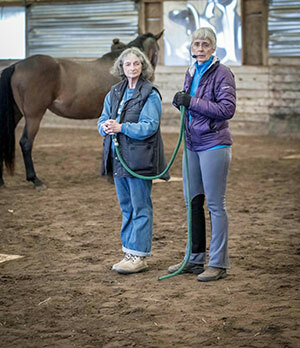 By taking the real horse out of the training/learning process and using a ‘human’ horse it allows for the learner (trainer) to have much less to worry about while learning the mechanical skills needed. I have covered all the foundation lessons in my early blogs here so please head on back into the history and check them out. Many have demo videos to help you learn. The second clinic this October followed a slightly different format. The Friday night focused on training plans and how to break complex behaviours into their component parts, and further break these down in an attempt to get error free learning by the horse. During the evening, I planned a fun demonstration using Ben, one of the lady’s boyfriend, to help us out. I gave the ladies the behaviour they had to try and teach Ben. They could not talk to him and could only use capturing and shaping (both techniques we would use over the weekend) to get him to do this behaviour. We came up with a very detailed plan and each participant had one minute to shape the behaviour, which was a bow. Simple enough you would think. It was tag team training. And while it was great fun it was very interesting to see how the timing and observation of each trainer differed and this caused a LOT of frustration in Ben the learner. By the end he had absolutely no idea what we were trying to get him to do. This served as a valuable lesson to all, that once again timing and observation skills are critical to good training. 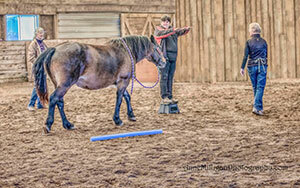 People and horses were paired up and each pair had picked a behaviour they wanted to work on. They had to have written a plan outlining the steps they were hoping to proceed through to get to the final behaviour. Some of the behaviours were trailer loading, hoof lifts, standing to be groomed, mounting block. It was fascinating to watch the teams figure out just where they could start in the steps they had figured out in their plans. It was equally interesting to see that each group came back to the foundation lesson of targeting. The groups progressed very quickly through the behaviours because they were thin slicing. They were setting up the horses for success. One of the most interesting stories from the clinic was the one of Jake. 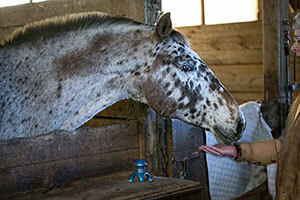 He is an older appaloosa who I spent perhaps five minutes with at the end of the first clinic. Jake is terrified of clippers! The mere smell or clipper oil or the sight of clippers simply passing his stall was enough to send him into frenzy, we made good progress in the first session in the spring, but the owner had just had a baby so she didn’t get around to playing with the plan we had set up. In the picture you can see Jake being very close to our pretend clippers…a massager that sounded a bit like the clippers. So several months later, with no training in between for Jake brought tears to his owner’s eyes when he picked up right where we had left off and within a few moments this time we could actually turn on the real clippers and have him remain calm and in the game. I will post the video as soon as I get it from Ottawa! I hope you all check back to view it. It’s pretty special. I look forward to going back next spring. Please contact me if you’d like to be put on the list. Photos by Anne Milligan. Training plans are so important. Would have loved to participate in Ottawa. Just a little bit too far away. Keep teaching and writing.